Whole year long every Bong waits for the Durga Puja to arrive and just within 4 days the festivity all over. Saptami, Ashtami, Nabami and the last day Dashami makes the end of all these grandeur. As the mythology says Goddess Durga bids farewell to her parents’ home and goes back to Kailash where her husband Lord Shiva resides. Puja in Kolkata is always special. Here in Bangalore though I got to see three idols and had a little taste of the whole festivity. Bijoya Dashami starts with the immersion of the goddess. We have a custom to share sweets to every near and dear ones. I don’t have much near and dear ones here in this land, thousands of miles away from my native. So to keep the custom going I had something special prepared for my friends. 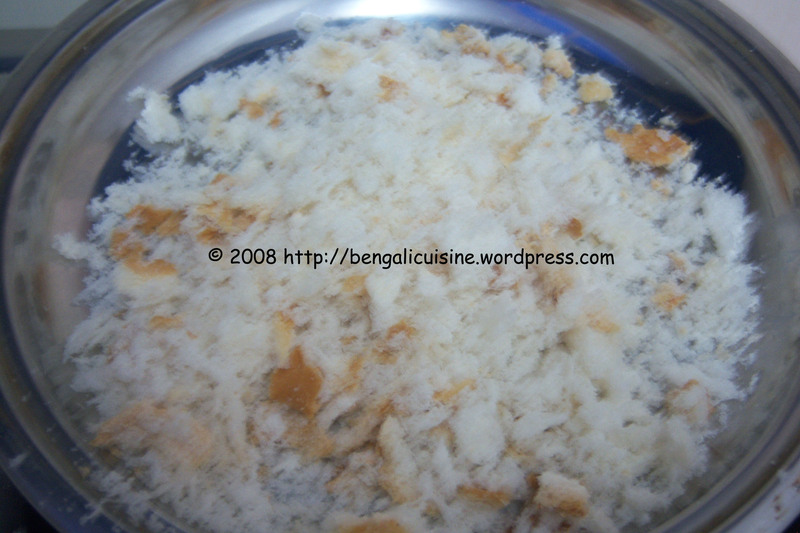 Sweet is the word that comes to mind when its Bijoya Dashami time. I am no exception. When everybody around wants to loose weight you can not just burden them with a huge plate of sweet, so caramel pudding is just to satisfy your sweet tooth as well as keep your calorie conscious self happy. • Boil the milk continuously for a long time so that it becomes one-fourth of its original volume. • Add the bread crumbs and bring to boil. • Keep aside to cool. • Take the eggs along with vanilla and stir it well so that it becomes less viscous and the vanilla gets well mixed with the egg white. 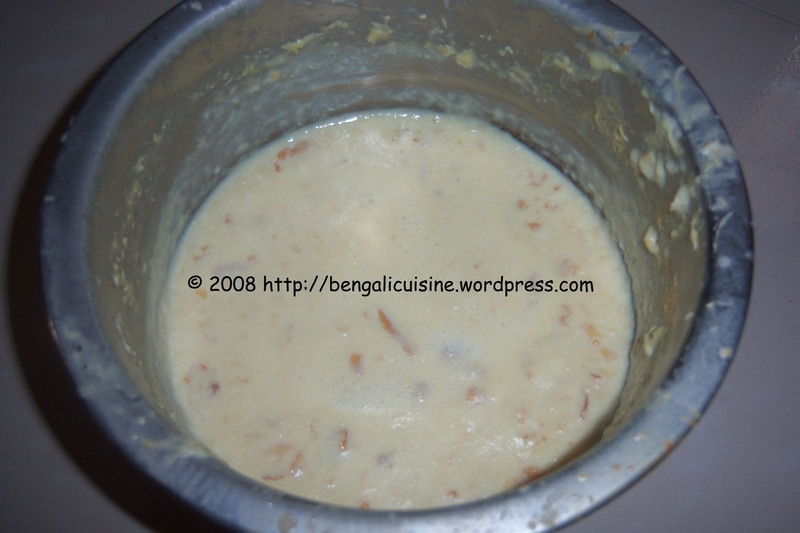 • Put the beaten eggs to the cooled milk and pour the whole mixture into a small steel tiffin box. • In a deep pan put the tiffin box and pour in water till the half of the box is under water. • Put the whole apparatus over flame and heat till vanilla smell comes out of it. Add water if necessary. • When the pudding is done take it out of flame and let it cool. • Open the lid and invert the whole pudding over a plate. Pour in a tablespoon of caramel and decorate with dry fruits of choice. Enjoy the caramel pudding as dessert for dinner or just serve it. With milk and eggs this one is a very healthy food for everyone of any age group I am sending this to Diet Food Event hosted by Divya. Also contributing this recipe to Low and Slow event. What better to celebrate this festival season than to send my recipe to Pallavi’s Yummy Festival Feast. Sending this to Santa’s Holiday Challenge hosted by JZ@Tasty Treats. We do it slightly differently. No breadcrumbs, for one thing. For another, we make the caramel first and pour it into the tiffin box/steaming container and pour the caramel custard mixture on top of that. So when the pudding is flipped out, it has a lovely, bittersweet brown top. Thanks for the entry Sudeshna.. This looks very interesting..
First time to ur blog..U have a lovely space here..Thanks for sending this to the diet food event..